Closed captioning for this video is available on YouTube: Siri Shortcuts: Selfie Strip. 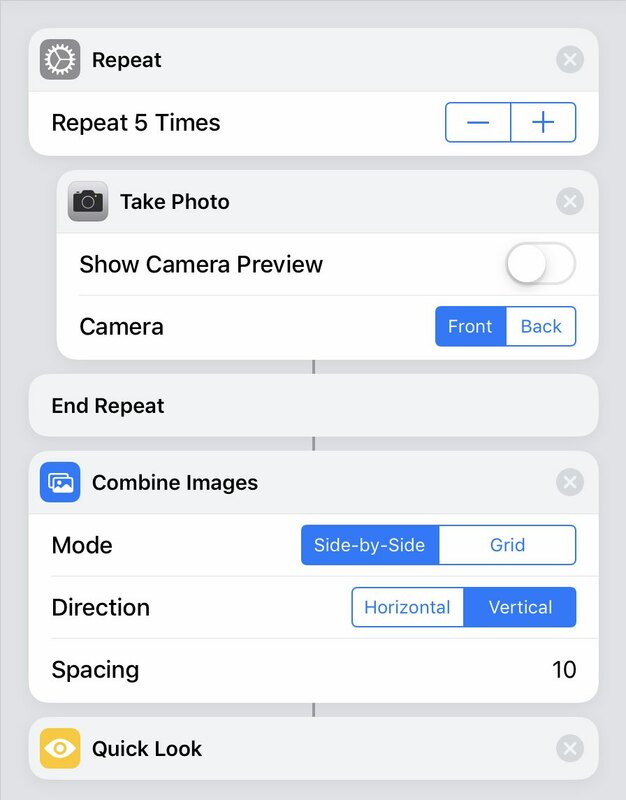 So let's take a look at an example of making a shortcut using the Shortcuts app in iOS 12. So we're going to make a shortcut that takes a picture but we're going to add a bunch of things to it. Let's go into the Shortcuts app here. If you don't have the Shortcut app go to the Mac App Store and search for shortcuts. It's the app from Apple. Now you have the ability to build these scripts, kind of like Automator on Mac, and you can assign them of course to Siri. So you can actually ask Siri to do it. I showed you how to do that a couple of weeks ago. We're just going to concentrate on building the script here. So I'm going to tap Create Shortcut here to create a new shortcut. Now the first thing we're going to do is we're going to Search because there's so many different actions you can add. You can look through them, and definitely do browse through them, but to get to things quickly we'll Search. We're going to look for camera shortcuts here. There's a whole bunch of different ones. We'll use Take Photo and drag that over here. It gives you some options. You can show the Preview of the shot. You can Take Photo and how many photos you're going to take and which camera you'll use. We'll do the front camera. So let's look at what we've got so far. If I press Play it brings up me. I take the photo and I have the chance to Retake at the bottom left or Use photo. I'll Use photo and it gives me the result there. Now that's far from being automated so we're going to change some things. We're going to take away the Preview. Let's hit Play now and it will automatically just take the picture and there I am. So this does it automatically. This is great! That's exactly what we want. Now what would be really cool is if we could take several pictures, right. A little strip like you're in a photo booth or something like that. So we can actually do that. We can look for things, commands, that repeat. So there's the repeat command. We'll bring Repeat over, drag that over here, there we go. You can see it has Repeat and then End Repeat. So we're going to have to drag the photo one in-between that. See how it puts it in-between there. So Repeat on time, take the photo, and End Repeat. Let's increase that to two times. Actually let's do it three times. So what will happen now, when I run it, is it will take three photos. So it took three photos and what we got was the last one. That's now really useful. What we want is all three of them. So there is a way to do that. Let's look for Combine. There is Combine Images. Let's add Combine Images here to the end. I'll drag that in and you can see the lines that link these. There's a line that links the End Repeat to Combine Images. So it's actually smart enough to realize that when you're doing the same thing three times it takes all three of those results and puts them in here. We'll do Combine Images how we're going to do it. Side by Side or Grid. Let's do it Side by Side but vertically. Let's increase the spacing a bit, so there's a little space between each one, to ten. Now let's see what we get. There we go. It actually took three photos and combined them and we can see it in the result there. That's not that useful still because all we're doing is seeing the result here in Shortcuts. So let's go and see what we can do with them. One thing we can do, is we can do a Quick Look. Quick Look displays results. Now it does more than that as you'll see in a second here. Here is the result. So this is the result of the script. There's my Quick Look. Notice what Quick Look does on the upper right hand corner is Share. I have the ability to Share that which is exactly what I want. I want to be able to trigger this. Have it take three shots, put them in a strip like this, a little bit of spacing between each one and now I can Share if I like the results. Or hit Done if I don't and it just goes away. That's perfect. I can actually do more than that. Like for instance I can look at Photos here and I can see there's Save To Photo Album right here. I can drag that in and just have it automatically save to Photo Album. I could also pick ones for say Messages here. I can have it Send Message with that. Send photo via What's app. There's a whole bunch of stuff. There's Instagram links and all sorts of things. So you can actually have this end instead of Quick Look and using Share you can have it actually do something automatically. I like this thing in Quick Look it's pretty versatile where you can actually do five versions here and, you know, have it do a really cool strip. There's my strip. Now I can share it. So I like that. Now I'll go to Settings here. I'll name it something. So we can name it Photo Booth Strip. Like that. We can hit the Add to Siri button to actually give it a Siri command. So I can actually just hold my iPhone up. I doing this on the iPad but I can do it on the iPhone. Hold the iPhone up and say Take a Photo Strip or take a Photo Booth Strip or whatever I want. I can add this to the Home screen as a Home screen button so it's almost like its own app or I can just run it here as a widget. You know when I hit Done here at the top right you can see Photo Booth Strip is now there so I can just go into Shortcuts and launch it from there. So there's an example of a simple shortcut thing that uses a couple of different actions including a very simple loop. This is a brilliant idea; fun and useful! It also helps me to open my mind to the possibilities and will definitely check out your other post(s). It also makes me eager for more examples of how to use Shortcuts. This is absolutely stunning. I knew I can rely on you to find things that are not immediately apparent. I know I will have a lot of fun doing this. Thanks a bunch. Puzzling result in that it works but the images are not showing up. in the photo app. Is there supposed to be a step to save the images? Ed: I explain at the end that the result goes to the sharing options, but you can modify it do the result goes to your Photos library if you wish.